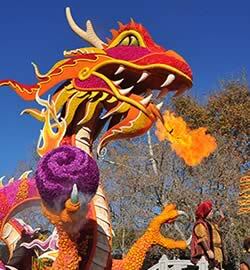 The Rose Parade features three types of entries: floats, marching bands, and equestrian units. 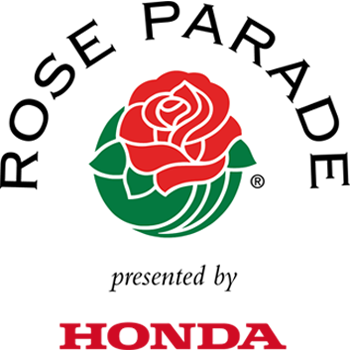 The only vehicles that appear in the Rose Parade are those that may carry the Grand Marshal, the Mayor of Pasadena, the Rose Bowl Game Hall of Fame Inductees and the Tournament of Roses President.  Many of the Rose Parade’s participating organizations have long histories with the Tournament of Roses and have made numerous appearances in the parade.  In order to submit as application for participation in the Rose Parade, you will need to create a new account in our Rose Parade Participant Portal. Follow the instructions within the Participant Portal and proceed to complete the application. 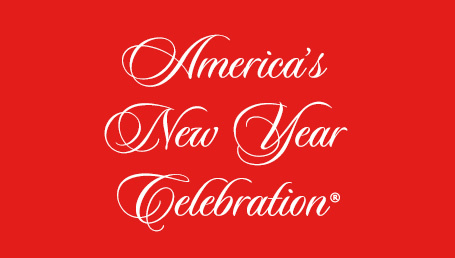 If you or your company and/or organization are interested in volunteering to decorate floats, visit our Volunteer page for more information. 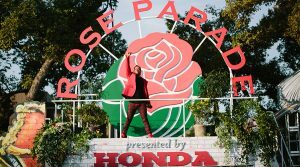 For millions of people around the world, the Rose Parade is an iconic New Year’s Day tradition. Share your story with this dedicated audience and impact hundreds of thousands of guests, up close and in person, on the streets of Pasadena. 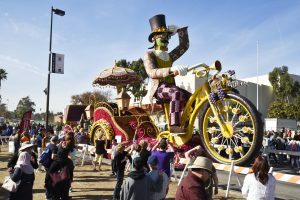 Create lifelong memories by offering your team a hands-on opportunity to participate alongside dedicated volunteers, building your brand’s float and the message you will share with the Rose Parade’s multigenerational, international audience. The possibilities are endless! If you want to learn more about how your company and/or organization can participate as a float entry, fill out our Float Participation Inquiry Form .  Email entries@tournamentofroses.com or call 626-817-9326 for more information about float participation. Bands are selected based upon a variety of criteria including musicianship, marching ability, uniqueness, entertainment value or special interest. In addition, bands with the ability to perform field show maneuvers while marching forward are encouraged to apply. Bands of any size are welcome to apply. Past parades have featured many band types including marching bands, drum and bugle corps, brass and percussion bands, and bag pipes. 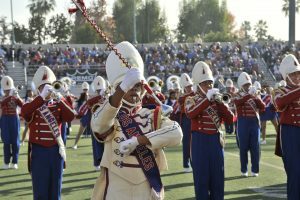 The Rose Parade has welcomed high schools, colleges and universities, and Military bands. The parade lineup has showcased bands from around the world, including Asia, Australia, Europe, North America, Central America, and the Pacific Islands. Email music@tournamentofroses.com or call (626) 817-9333 for more information about marching band participation. 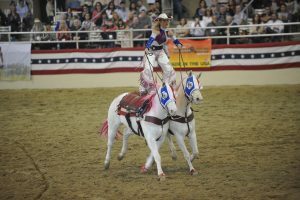 Each year, the Rose Parade features a wide variety of horse breeds who entertain spectators, each with their own style and grace. Previous breeds have included Curly Horses, American Saddlebreds, Gypsy Cobs, Andalusians, Miniature Horses, Draft Horses, and more. Equestrian units also vary greatly with special skills and colorful costumes. 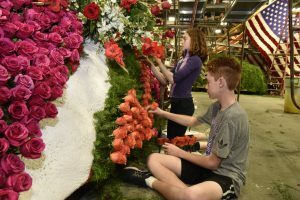 The Tournament of Roses considers how each group ties into the Rose Parade theme and continues to honor traditions while looking for new and different participants. Although there is no minimum or maximum equestrian unit size requirement, average group size is approximately 10-12 riders. Email equestrian@tournamentofroses.com or call (626) 817-9333 for more information about equestrian unit participation.